I thought my question was simple - why did the X-1 fly with straight instead of swept wings? Even before WWII started the information of its advantage was available, yet still two years after it ended, the fastest aircraft in the world flew with a straight wing. Clues to the answer led me to Jake’s Jeep. Eastman Jacob was a scientist at NACA Langley and led the team of fellow engineers responsible for research that generated a series of laminar airfoil sections that contributed to the P-51 wing profile. When the bosses asked for his thoughts about high speed flight involving jet propulsion he felt that a piston engine driving a compressor and then burning fuel in the high speed mass of air would result in thrust great enough to push a research aircraft to around 550 MPH. Jacob got the okay to go ahead with his studies and started the design of the engine. At the end of the 1930s very few engineers were thinking about flying at anywhere near supersonic speeds and considered a piston engine driven compressor the most practical way to create a jet engine. One use for this type of engine was to augment existing engine installations and modifying a Martin B-26 was an early choice for its application. Of course once you start building a new type of engine you start dreaming of a dedicated airframe to go with it and the idea for the “Jeep” was born. This all happened before Gen. Hap Arnold of the US Army Air Force went to England and witnessed the flight of the British first jet aircraft. 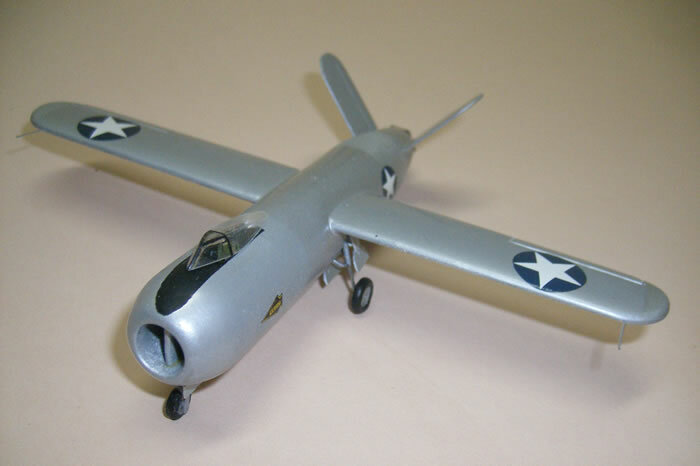 American representatives returned in the fall of 1941 with the British design for their jet engine as well with a prototype Whittle engine. Now the ironic part, so secret was this information that NACA was not informed. Jacob was allowed to continue his work on his engine and began on the airframe. This was the National Advisory Committee for Aeronautics and the military was very intentionally keeping it out of the loop. A key reason later given was NACA began to become very busy in testing the new aircraft and piston engines planned for the soon to come war and Arnold did not want NACA or any other group to get sidetracked. Another reason was quite frankly at this time even with the Whittle prototype nobody was certain an American version would work and the USAAF wanted a second powerplant concept to compare against. Problems with finding the right process to obtain efficient combustion resulted that the Jeep’s engine wasn’t ready to give a demonstration until afterthe pure jet engined Bell P-59 flew. At this test some of the officials attending had already witnessed that historic flight but still were not allowed to inform NACA of this fact! By early 1943 the secret was out and it was clear that the “Jeep” had no future; NACA finally received a P-59 in 1944 for research. Its simple shape made Jake’s Jeep a natural for a scratchbuilding project. The most asked question I get is how I turn a few obscure images into a model. Years ago it took a long time to create workable drawings. There is a technique I found in a WWII period magazine on how to make three views from a picture that I used for nearly 20 years working with my drafting tools from college. Mercifully a few years ago I came across ModelCad design software for the computer. Now I import an image into the program and pick off points to start the rough draft. There were two cutaways drawing of the “Jeep” and photos of the wind tunnel model found during my research. Normally there is something on the subject that has a known dimension like the US national insignia I would use to figure out the aircraft’s size. Description of the “Jeep” mentions what type of piston engine that was buried in it. Once that dimension was entered, the program called off what information I highlighted. Subjects photographed not straight on have a bit of an extra challenge but I must have learned something in that drafting class many years ago that help me to eyeball aircraft. Once satisfied with a drawing, it sized for making 1/72 scale templates which are printed out and glued if needed to the material and used to make the pieces. Every model I like to try something new. This time I tried to turn the circular fuselage on a mandrel made from a threaded rod chucked into a drill (my lathe died; when I’m done with this I’m ordering the replacement parts). I had some PVC tube leftover from a plumbing job; I stuffed it with different size Evergreen tubing to give it the final inside diameter needed. The tubing was slid onto the threaded rod and held tight with washers the final outside diameter and nuts then spun. For me, this process worked so well that I immediately made another fuselage for a future project. Styrene sheet was used for the wings and wire for the landing gear. I was planning to vacuumform the canopy but I noticed the canopy leftover from a Douglas 588-1 kit was close enough that with some file and sandpaper effort finished with a bath in Future wax I had the shape I needed. Deciding what color to paint it was almost as hard as creating the drawings. The wings were easy; I assumed they would be finished like a Mustang’s in aluminized paint. Since the aft end of the “Jeep” got very hot it would forego painting and since it was a test airframe I felt the forward end would also be left in bare metal. It was finished with four different shades of Flouquil and Testor’s silvers. The national insignia were for the 42’ time period it would he been completed in. I had the Wright arrows lying around for years and it made sense to me that the aircraft would wind up at the Air Force Test Center located on Wright field. A real simple cockpit layout was made and around that area a flat black anti-glare shield was painted using Testor’s acrylic so it wouldn’t react with the silver. The model is 5 inches long with a wingspan of 6.5 inches. The extreme secrecy maintained by the USAAF on the Whittle engine had an impact on the US aeronautical industry. It believed that there were no easy or safe method in propelling an aircraft anywhere close to the speed of sound and therefore no impetus given to examine the benefits of swept wings. The loss of control problems encountered with the newer fighters types at high speeds were solved by a NACA designed dive recovery flap to quickly slow them down to regain control, not to allow them to operate at the higher speed. NACA and others in the US were well aware of swept wings but during 1944 when the idea for the X-1 began to come together it was decided to be conservative and fly with straight wings rather than to try an untested concept. When captured German aeronautical data confirmed what the Americans already knew about the subject in 1945, the X-1 was too far along in the construction process to economically make the change. Jake’s Jeep engineering and research effort did influence some later jet engine’s components designs notably in compressors and afterburners. 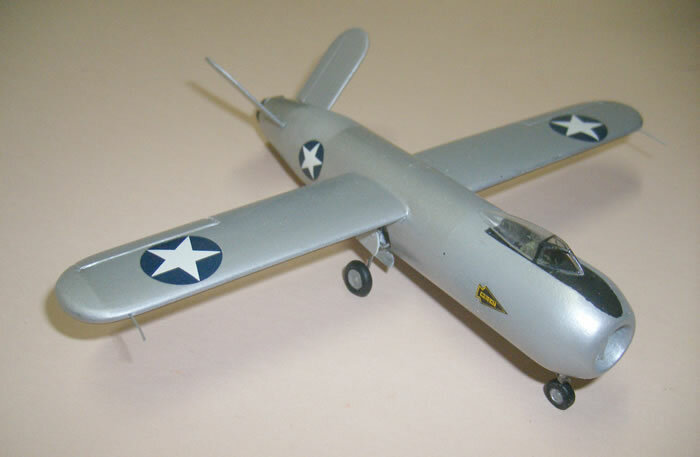 The model was created to represent if not a milestone aircraft, at least the effort. 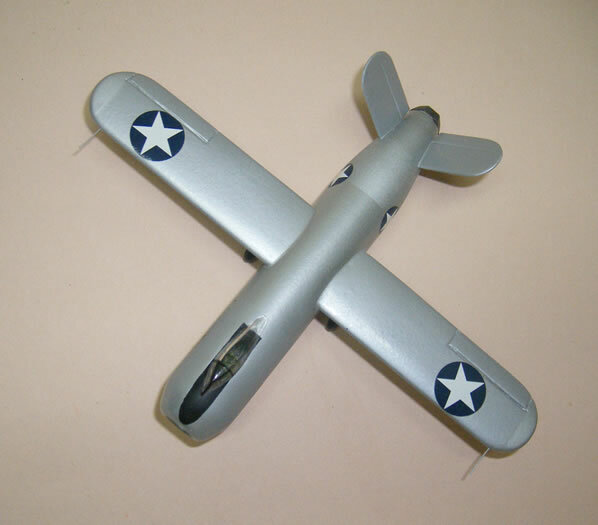 And like the engine itself, people can compare different aircraft designs of the mid 1940’s in my model display.